I was musing yesterday as I was visiting a budding community garden. Most follow the model of outlining beds using timber and then filling in with soil. 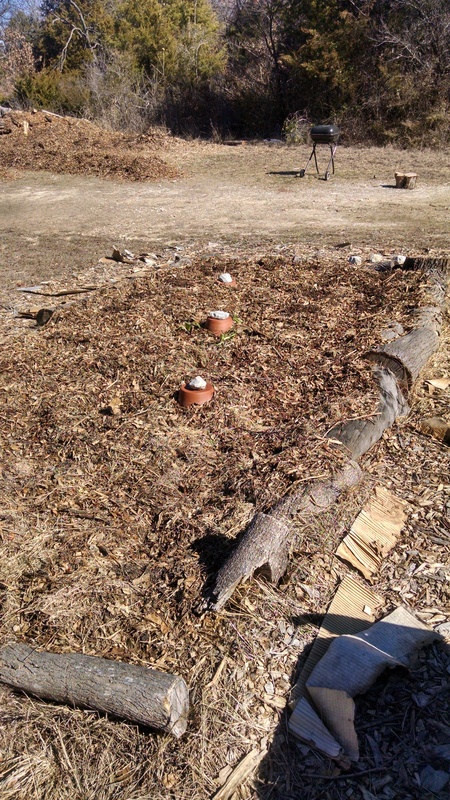 Sometimes there is a compost pile and compost and mulch are applied sparingly. What if there is another model that is yet to be implemented which is water-wise and drought tolerant? Much like the beds I saw (and posted a picture of them) in the southern Dallas county garden – outlined with logs from the property, filled with mulch several inches deep and with ollas for watering. 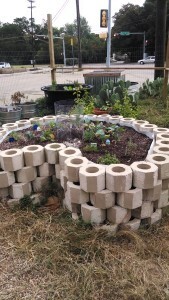 What if hugelkultur beds became the norm – like a community garden in Plano is working toward? Or keyhole gardens? or other techniques borrowed from drought-stricken areas around the world? If we are to continue to install gardens for the community – and promote and practice farming in the city – then we need to think outside the box as water restrictions become the norm rather than the unusual. The keyhole garden technique was developed by nonprofits working in dry-land Africa. The goal was to create a garden bed that would grow the maximum amount of food crops for families with a minimum of water. It is essentially a compost pile within a wall. 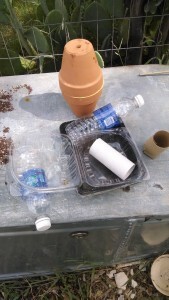 Once the bed is established, the central wire cylinder is the place that compost (kitchen scraps and other compostables) is placed, and any watering that is done is in the cylinder. 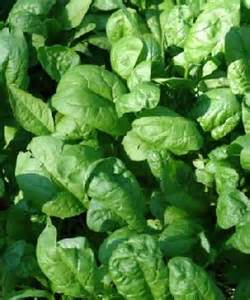 The moisture is then pulled out into the soil where the roots are as it is needed. A structure of bent PVC pipe creates a framework to support either shade cloth, to protect plants from searing summer sun, or poly to extend the growing season from early spring to late fall and possibly through the winter here in North Texas. Dr. Deb Tolman, from whom I learned the technique, says that you start with a dumpster load of cardboard that goes into the garden, along with piles and piles of leaves, newspaper, food scraps, manure, old cotton t-shirts, straw, grass clippings, and anything else that is compost-pile fodder. These are carefully moistened as they are stomped down and compressed before additional layers are added. Then the whole thing is topped by compost and top-soil. And planted. Building a keyhole can be a group party – with a large group, once the wall is built, it only takes about 2 hours from start to planting! One important advantage of a keyhole garden is that it is perfect for someone who cannot bend over to weed or plant, yet wants to continue to garden. It’s a raised bed extraordinaire! 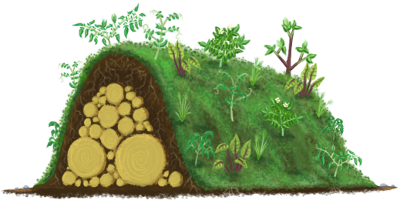 Contact me if you want a hugelkultur bed or a keyhole garden to be part of your gardening experience this year! 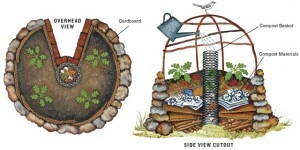 Posted in gardening, hugelkultur, keyhole garden. 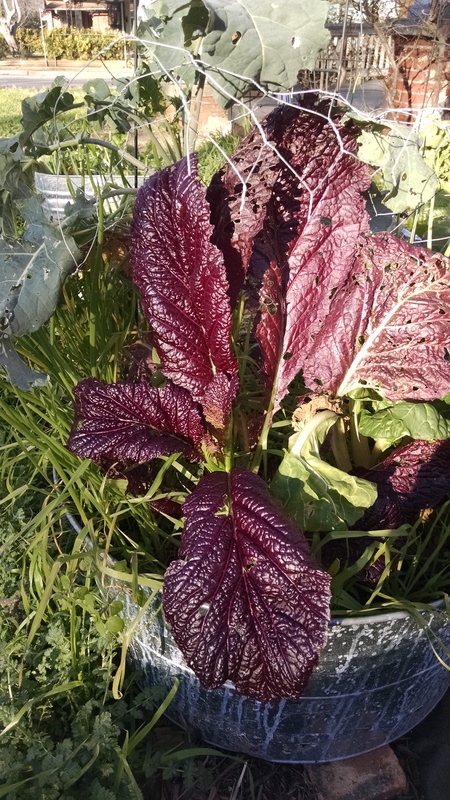 Community Gardens Are Busting Out All Over! The last two weeks have been hectic. The Community Garden Conference in Grand Prairie, sponsored by the Tarrant County Food Bank and assisted by the North Texas Food Bank, was well attended. 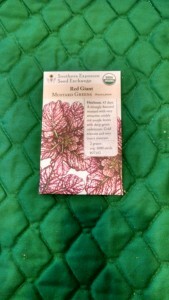 I was there with GROW North Texas; we team-taught a seed starting class. Andrea, the GNT Farmer Advocate talked about soil mixes, while I got my hands dirty and muddy, mixing up the seed starting concoction, and then I lead the “trash talk”. In other words, how to start seeds by repurposing things like toilet paper rolls and empty water bottles; how to roll a newspaper pot with a spice jar, and how to convert a strawberry clamshell into a mini-greenhouse. It was lots of fun, and a majority of the attendees took advantage of the hands-on, to plant some seeds and make some seed-starting pots. On Sunday I had a chance to visit Divine Kinship’s project in southern Dallas County. They are working with permaculture instructor Nicholas Burtner to transform a 3+ acre piece of property that is currently grass and cedars. It has a lot of elevation changes, a seasonal creek on one side, and a variety of soils ranging from caliche to sand. It’s almost overwhelming all that they have to do to transform the property into a food forest and permaculture scape. But large jobs are best broken into manageable pieces, and they are setting up raised beds, with plans to start planting in the next few weeks. The beds are crafted from logs, and filled with wonderful mulch that will break down into incredible soil. The mulch will also hold water from the rains. Note in the middle of the bed you can see some reddish bumps with white dots on top. Those are terra cotta pots, made into ollas, with rocks covering the holes on the top. I’ll be teaching a DIY olla class, as well as using other recyclables for repurposing soon. Posted in community gardens, garden, gardening, seed starting, seeds. I spent all day readying the “homestead” for the cold, arctic front that is supposed to drop temperatures into the teens by morning. Covered the faucets with either a bucket or, in the case of the front faucet, taped some of that airy packing material Amazon uses around the pipe. Disconnected the hoses, to allow air space in the pipes. 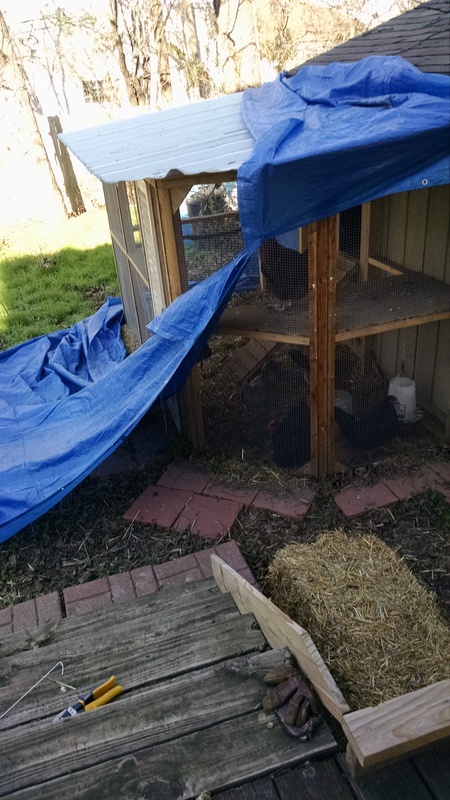 For the chickens, I took out an old 18’x12′ tarp I had in the shed. With a helper, I managed to get it over the run and enclosed the run, staking it out on one side like a tent. 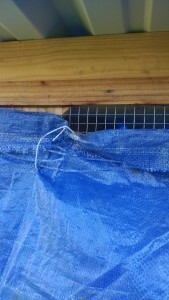 BUT….I came back later and found that the tarp had ripped – well, separated is more like it – on the seams where the three 8′ sections had been bonded. Oops! So what to do, what to do? I used to use coat hangers for everything – they are really very handy. So I got out my wire nippers and a couple of coat hangers along with a pair of pliers and attached the top of the middle section of the tarp to the hardware cloth of the run. Although not totally enclosed now, I’ve at least blocked most of the north and northwest winds, the chilling ones. I anchored the bottom of the tarp with bricks and pavers. I’ll know how effective it was in the morning – by seeing if the chickens’ water is frozen. About 8 or 9 tonight, I’ll heat a red brick in the oven to 350 degrees, wrap it in an old pillowcase, and put it into the coop. The radiant heat will help the chickens (I know….they have down and feathers, but I worry about them and spoil them) weather the cold. 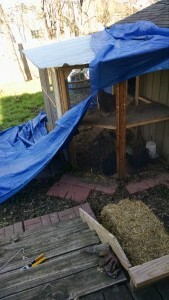 Posted in chicken flock, chickenkeeping, chickens, freezing weather.